Astronomers used a vast network of radio telescopes to obtain many images of supernova 2014J, revealing a lack of radio emission from the supernova and providing scientists the opportunity to learn more about these extremely important astrophysical phenomena and their underlying cause. The supernova, a giant explosion of a star and the closest one to the Earth in decades, was discovered earlier this year by chance at the University of London Observatory. These phenomena are extremely important to study because they provide key information about our universe, including how it is expanding and how galaxies evolve. The new research into its cause, published in the latest issue of the Astrophysical Journal, used vast networks of radio telescopes in the UK and across Europe including the seven telescopes of e-MERLIN operated from The University of Manchester’s Jodrell Bank Observatory. These enabled them to obtain extremely deep images revealing a lack of radio emission from the supernova. Known as 2014J, this was a Type la supernova caused by the explosion of a white dwarf star, the inner core of star once it has run out of nuclear fuel and ejected its outer layers. A white dwarf star can explode if its mass increases to about 1.4x times that of the Sun. At this point its core temperature reaches the point where carbon starts to undergo nuclear fusion. This spreads rapidly through the star resulting in a catastrophic thermonuclear explosion which rips the star apart, causing it to appear like a brilliant ‘new star’ shining billions of times brighter than the Sun. For decades there has been a dispute about how this happens but these new results rule out the vast majority of models and show the merger of two white dwarf stars is by far the most likely cause. The research was led by Miguel Pérez-Torres, researcher of the Spanish National Research Council who explained: “Supernovae play a fundamental role in the chemistry of galaxies and their evolution, as they are responsible for ejecting most of the heavy elements we see around us, including elements that cannot be formed in the interior of normal stars. A Nobel Prize was awarded in 2011 for the use of Type Ia supernovae to discover that the expansion of the Universe is accelerating. Yet, the basic question of what causes a Type Ia supernova was still a mystery”. 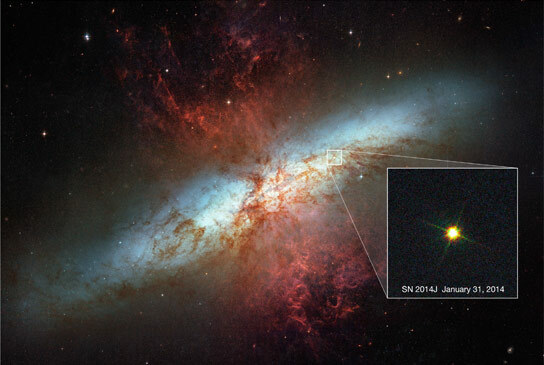 Be the first to comment on "Supernova 2014J Reveals Key Information About Our Universe"